About Clarence Park Picturesque is the best word I can use to descibe the ground and I cannot do it the justice it deserves. The St Albans website has an excellent and comprehensive history that can be viewed here. How to get to Clarence Park If you are driving the exit M25 at juntion 22 (A1081). Follow signs to St. Albans from slip road. At London Colney rbt (traffic light controlled) exit onto A1081. Follow road for approx 1 mile until mini rbt (Great Northern pub on left). Turn right into Alma Road. At traffic lights turn right into Victoria Street and continue to junction with Crown pub. Go straight across into Clarence Road, ground is first on left about 50 yards past junction or take the next turning on the left into York Road, ground entrance is at the end of the road on the left. If you are coming from the A1 then exit at Hatfield Galleria and follow the A404 towards St Albans and then turn right at the roundabout with the A1081, then as above. There are a very small number of parking spaces in the park (pay and display) otherwise it is free street parking around the park. St Albans City station is on the Thameslink service from Kings Cross Thameslink (20 mins). Turn left out of St. Albans City station into Station Way and cross Hatfield Road into Clarence Park. Follow the path round to the right of the ground until you reach the main entrance. How to get a ticket for Clarence Park As with most grounds in the non-leagues there is plenty of room for everyone to watch a game at Clarence Park. The capacity is 6,000 so there is no need to buy any tickets in advance. The turnstiles are in the south east and north west corners of the ground and admission is £10 for Adults and £3 for Under 14’s. There is a £2 upgrade to the stand which is advisable if the weather is poor. If you want to use the clubhouse before, during or after the game you have to actually leave the ground and climb the stairs behind the main stand and then show your ticket to get back in. Our last visit – St Albans City 1 Lewes 1 – 22nd August 2009 So this was where the stakes in the TBIR/EFW trophy were raised up a notch. The chance to see our players in action at one of the most picturesque grounds in the lower leagues. The original plans to meet up were scuppered by traffic around the whole of the M25 and it was nearly 2pm before Lolly and I arrived at the smart looking Clarence Park. 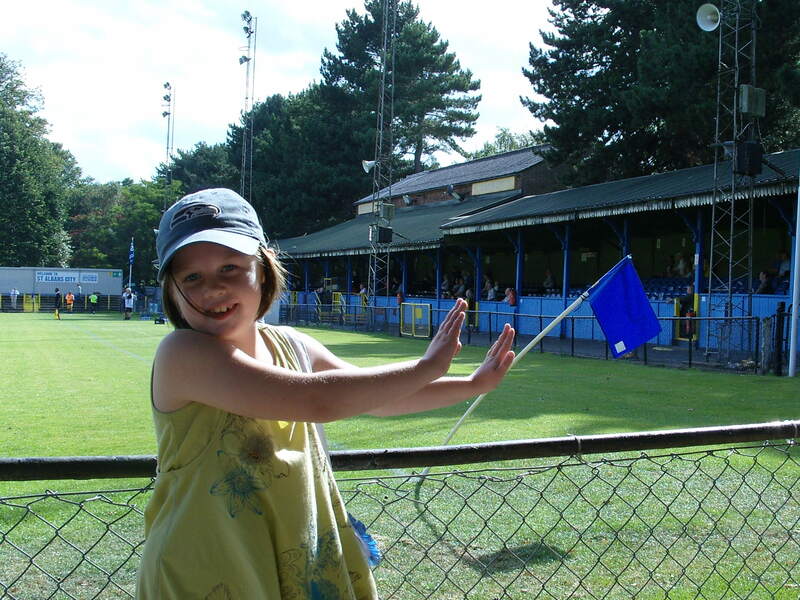 St Albans City play in a ground that sits within a lovely park just to the north of the railway station. The club, in an all too familiar story in the non-leagues were fighting for survival and so it was only fair that we helped them out with a few pints in the clubhouse prior to the game. The usual Lewes travelling army of Danny, Deaks and Cynical Dave were already there, watching events unfold at the Oval. 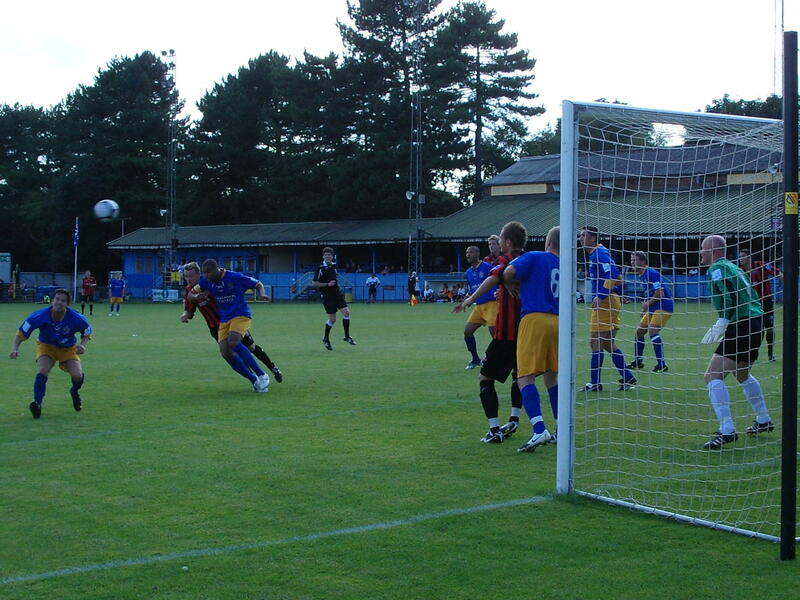 St Albans had been back at this level for a couple of seasons after playing at the Conference National for a season back in 2006/07 only to be relegated the following season. Since then it has been mid table mediocrity in the Blue Square South and so with Lewes’s form of 3 draws and a defeat coming into this game meant it was going to be a battle of wits. Lolly and I were disappointed to learn that Ryan hadn’t been included – no injuries to report so the decision was tactical. Based on the fact they were still looking for their elusive first win you would have thought a pacy, tricky and elusive (his words not mine) winger would be a good option – so why not pick him Mr Ibbitson! The first half was hardly a classic. Player-coach Danny Cullip livened up proceedings by being set to the stands (and remember in non-league football that means sitting yards away from the bench) for swearing at the linesman and apart from a Dan Beck lobbed effort stalemate sums up the efforts from both teams. We had been joined by Cornish Al, one of my goalkeepers from the EnglandFans team who lived locally. He gave us a run down at half time on the club and what was going on. He also told us some of the story of Clarence Park, including the fact that the smart blue and yellow crash barriers around the ground had come from Wimbledon’s old ground at Plough Lane, and the floodlights from Reading’s old Plough Lane – never a lender or a borrower be eh! So with the sunshine making it a perfect afternoon for watching the game we came back out for the second half. We had all paid our £1 for a golden goal ticket, and I was the only one left with a chance of winning. Poor Lolly had drawn the 1st minute and wasn’t happy that I could still win (at least she didn’t have a tantrum which is what Littlest Fuller would have done at losing!). My winning time was 73 minutes and it was hard to see how anyone would win. But them came a moment of magic from Lewes, and dare I say it, Sam Crabb. Lewes broke down the right, Dave Wheeler crossed and there was Crabb running in to smash the ball home. He had already seen Danny watching and so he ran over to give his benefactor a big hug…The time on the clock was 3 minutes shy but it was worth it if Lewes got a win. 93 minutes were on the clock when St Albans had a corner. From somewhere the referee had found 4 minutes of injury time and that was to prove decisive as from the cross Peters headed home to send the St Albans fans into raptures. The Lewes players were understandably stunned, but within a minute a hopeful punt up field allowed the Lewes centre forward a one on one with the keeper but he pulled it wide and with it any chance of 3 points. So a win had turned into a draw and the EFW crew trudged back to the bar to drown their sorrows, although Dave winning the club lottery and a crisp £20 did at least bring some cheer to the end of the day. I explained to Lolly as we walked back to the car that football isn’t as always as good as this in terms of the setting and the weather, but is often as cruel. With Ryan’s shirt under her arm, some new tips for Super Mario Bros from Mr Last, and a few new swear words from Cyncial Dave she had had a very productive afternoon!